REMOVAL of organic toxins from groundwater requires chemical additives, which are expensive and environmentally hazardous. Now researchers at the University of Kentucky in the UK have developed a novel technique to break down such contaminants. The new purification system uses two highly porous membranes to generate purifying hydroxyl radicals. Till now organic compounds were degraded using Fenton reactions—a method based on the concept that some metals like iron have a strong catalytic power to generate highly reactive hydroxyl radicals. The radicals react with, and ultimately degrade, the organic impurities. Other than the use of chemicals the process also requires acidic conditions. “Our approach immobilises the iron in a membrane pore and thus reaction can be carried out at near-neutral pH conditions,” says Dibakar Bhattacharya, one of the authors of the study. The new device has two porous, micro-filtration membranes. To purify water, glucose is added to it and then passed through the first membrane. Here an enzyme— glucose oxidase—converts the glucose to hydrogen peroxide. 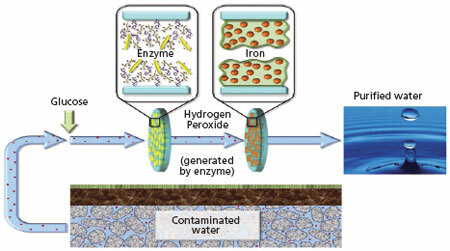 In the second membrane, the hydrogen peroxide reacts with the iron, and thus purifies the water. The details of this remediation system were published in the April issue of Proceedings of the National Academy of Sciences. “The concept has been developed for organic detoxification, but can be extended for disinfection and virus inactivation,” says Bhattacharya. The researchers say as the level of hydrogen peroxide in the filter can be controlled, and because iron is trapped in the membranes, no additional chemicals need to be supplied. The operating cost of purification is estimated to be about seven US cents per 1,000 litres. “The energy cost is also low since we use highly porous microfiltration membranes; the materials are commercially available,” says Bhattacharya. In contrast to traditional membranes that reject impurities, in this purification system pollutants are allowed to pass through the pores, allowing the reactants to convert contaminants to non-toxic end products. Reviewing the purification system, Pawan Labhasetwar, scientist at the National Environment Engineering Research Institute in Nagpur, says the technology can be used in India. But several factors such as membrane fouling (accumulation of unwanted material), filtration efficacy, inlet water characteristics and their impacts on the system must be studied in detail. The implications for those in "developing countries" are astounding! It's only a matter of time before such a device/system finds itself purifying water in the growing population centers of countries like India, always in need of clean, potable water, among other things. This is very good news, as far as I'm concerned. Eyes peeled and watching out for any more information about this. Thank you for this information. I am also on the look out for better, simpler and cheaper technology for water purification. Our homes are badly in need of it. My town has a community RO plant but one needs to go and fetch it everyday not to talk about water getting contaminated during refill.